One of the gravestones in the eerie St. German's Cemetery. 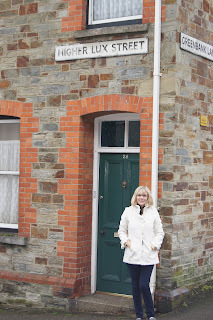 I eagerly awaited my visit to St. German’s Cornwall, the town where Mary Ann had come into this world on November 27, 1833. Records indicate she was christened eleven days later in her mother’s home parish of Menheniot, and spent most of her Cornish adult life in St. Ive, a small mining community, making a triangle of towns. I wanted to walk the trails she walked, touch the trees that grew when she called Cornwall home, and most of all, look for the burial homes of “the little girls” our affectionate sobriquet for Mary Ann Symons and Mary Jane Davey. As we had never been able to locate any records indicating where they were buried, we were determined to scour all the cemeteries in places the family had called home. The day we pulled into St. Ive, it was gray and overcast, made even gloomier by the early setting sun in the January sky. I knew Mary Ann’s mother and sister were buried in the church cemetery here, thanks to the parish clerk who had emailed me a photograph of their gravestone. Knowing it was near the bare shrubs and crumbling hydrangeas that lined the perimeter of the churchyard, I tramped through the mud with butterflies in my stomach. Several months earlier I had been in Africa. Many people had told me when I walked through the savannah or sat in the shade of a baobab tree, I would feel the line of ancestral footsteps that had tread on this continent before setting forth on the migratory journey that would populate the planet. To my dismay, I felt nothing, my hollow feeling likely made barer because I expected to feel these echoes. But, on this gray day in Cornwall, joy enveloped me as I walked toward the gray stone church. My quiet veneration was interrupted with the disappointed voice of my husband. The more he had negotiated the car along the ribbon lanes of Cornwall and Devon, the more determined he had become to find the graves of “the little girls.” But they were not here. I could tell he was crestfallen and loved him all the more for his deep and obvious dedication to my ancestors. The next day, the search began in earnest for the marker indicating the final resting place of Mary Ann and Mary Jane. Liskeard seemed a logical beginning spot for this quest, given that both death certificates listed Higher Lux Street, Liskeard as the location of death. Greg and I divided the churchyard into search coordinates and began the examination of the lichen-covered, deteriorating markers. So many were faded or falling, leaving us unable to read the names of those who lay below. This churchyard stood on high, spongy ground and the day was sunnier, giving us a lighter feeling, matching our hopeful attitudes. And despite the sad nature of our quest, we did feel hope. Finding their resting place and paying homage would honor their lives and that of their mother, a woman who just two years after her daughters’ deaths would embark on a journey taking her to a new life in a new country. But our hope soon turned to frustration. So many gravestones just could not be read, and those that were legible, were not the ones we sought. Greg is a master traveler and constantly asks questions. This propensity led us to hidden graveyards of the era, ones we would likely not have found without his tenacity. We were directed to different cemeteries and searched through Menheniot, St. Anne’s, and little spots along less-traveled roads. We tramped around the large, estate-like church at St. Germans and eventually discovered the ghostly graveyard perched high on the road across from the place of worship. The Cornish dusk was again laying its covers on our shoulders, but determined, we brushed away the branches of the low-hung trees and bristly shrubs of this aged hallowed ground. As we searched, ravens swooped above us and screeched as if to warn the inhabitants of our intrusion. Usually when looking, I craved serenity and avoided talking to or calling out for Greg, but in this eerie place, I wanted reassurance of his presence. Finally, we hugged. We knew we were at a dead-end. We never did find the graves of “the little girls,” Mary Ann’s daughters who had died too soon. Later, we learned it was common for the farm laborers and miners to simply bury the dead in unmarked plots in the churchyard. During the Victorian era, the poor were often buried in layers, an unnerving explanation for why the ground often felt springy as we searched. 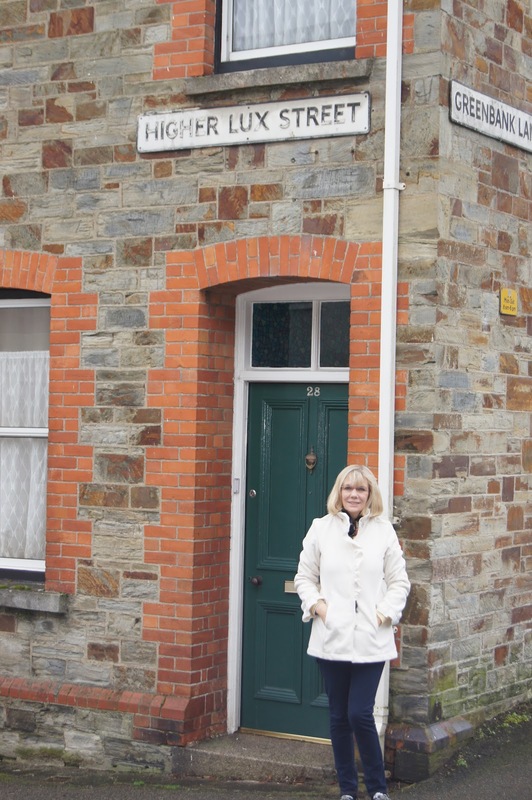 I had to be content with standing on Higher Lux Street in Liskeard, the place where they had said good-by to this world. So, we returned to this spot. Standing here, in my own quiet, I did feel the souls I never experienced in Africa. This was my heritage, the place of my mothers. I had come home. I so apologize for not replying to the kind comment you left on my blog sooner than this. My sister had surgery and I took her to WI for it and when I returned home, I completely forgot to answer you. So sorry! I was thrilled to hear about your interest in the St. German's Cemetery. I believe I have more photos which I am happy to share. I did not notice the vault you refer to - do you have a photo of it? The reason I ask is that I, too, live in the U.S. (Annapolis, MD) but will be returning to the U.K. in mid-June. My husband has agreed to 5 days of research in Cornwall/Devon before heading up to Scotland. I am happy to take any photos you might want. Let me say, I have walked through a lot of cemeteries in Cornwall, and that one was scary!! I really need to write a blog post on our experiences there. Amazing - the crows made it Poe-like! PS - Tried to email this to you but it was returned.